Ge'ez is the ancient language, and was introduced as an official written language during the first Aksumite kingdom when the Sabeans sought refuge in Aksum. The Aksumites developed Ge'ez, a unique script derived from the Sabean alphabet, and it is still used by the Ethiopian Orthodox Tewahedo Church today. Tigrigna and Amharigna (Amharic) are the modern languages which are derived from Ge'ez. Amharic is the official national language of Ethiopia. 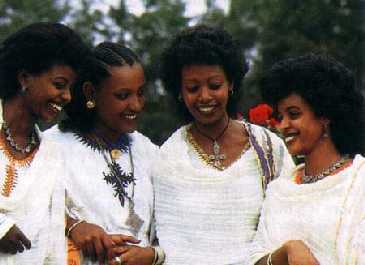 English, Arabic, Italian and French are widely spoken by many Ethiopians. The Ethiopian languages are divided into four major language groups.These are Semitic, Cushitic, Omotic, and Nilo-Saharan. The Cushitic languages are mostly spoken in central, southern and eastern Ethiopia (mainly in Afar, Oromia and Somali regions). The Cushitic languages use the Roman alphabet and Ge'ez script. For example, Oromo is written in the Ge'ez script whereas Somali is written in the Roman alphabet.